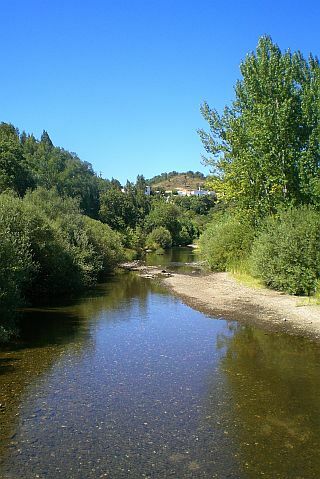 The countryside of São Marcos da Serra is a wonderful scenery for walking, mountainbiking, bird spotting or simply enjoying the healing sound of silence, the great smells and the unspoilt nature. Almost everywhere you can find sobreiros (cork oaks), azinheiras (holm oaks), eucalyptus, medronheiros (strawberry trees), wild herbs such as rosemary, mint and lavender, heather and esteva (rock-rose). In springtime, nature performs a remarkable show, transforming hills and mounts into a festival of colours and smells. But even in the summertime there is always a green background in all your views. Stand still and spot the bee eaters, swallows, house martins, hoopies and many others birds. Search out the kingfisher, the owl, the eagle and the sparrow hawk. Listen to the cuckoo by day or the nightingale in the evening. Be amazed by the variety of butterflies, their colour and intricate design; the noisy frogs and toads, the shy lizards and the playful geckos. There are plenty of species inhabiting these mountains, such as the wild boar, foxes, mongooses and partridges. In the autumn and winter the hunters are crossing the hills, looking for a prey. 400 years ago the Iberian brown bear walked through the serra and 20 years ago the Iberian lynx was still present. The wolf used to be the major concern of farmers until the 19th century. 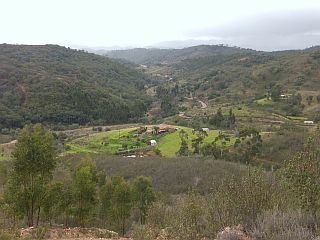 In the old days people made a living in these hills with their cattle (goats, cows and sheep), agriculture and hunting. They made their own furniture, clothes, shoes and tools. 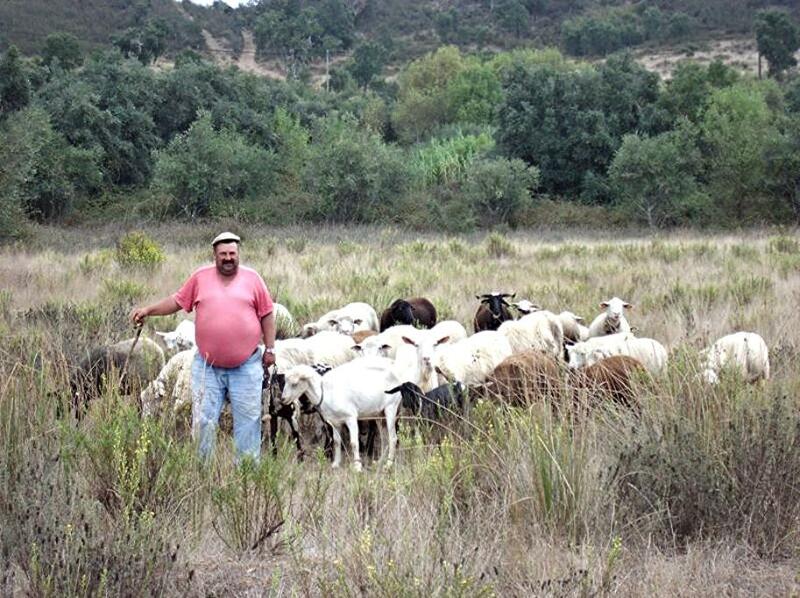 Even today you may be lucky and meet a shepard that walks his flock through the countryside. Hopefully European rules will not disturb these romantic sceneries. The fruit of the medronheiro (arbutus or strawberry tree), quite common in the area, is used to distillate the famous and appraised aguardente de medronho. Even today many farmers still make their own in the wintertime. They pick loads of ripe fruit from the medronheiros from October till December, leave it in big barrels for 2 to 3 months to ferment and distillate it with special copper equipment. You would be amazed to know how much work is involved before you can taste this special "eau de vie". Read more about medronho in a way of life. Also a delicious and very high quality honey (mel) is produced in this region, thanks to its rich and diverse flora. A speciality is the so called água-mel, a sweet delight made of water en honey. The honey is also widely used in local sweets and cakes. Have a look at traditional food to find some recipes. 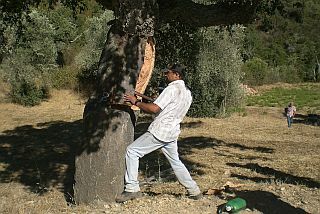 Every summer you can see the cork strippers (tiradors) working in the mountainside, carefully peeling the precious outer layer off the cork oaks. When they are done, they mark the tree with a number, that refers to the year it was peeled. It takes about 9 to 10 years before this can be done the next time. Unfortunately there are a lot of cork oaks dying of a disease related to fungus and lack of rain in this region. A solution is not yet in sight. Only some 100 years ago the production of cork became important to Portugal. That was when the cork industry started producing stoppers for wine bottles and champagnes. Cork is nowadays being used to produce all kinds of things, such as cloths, floors, handbags and shoes. This material has very specific qualities. It insulates, it is light and fire-resistant, it does not absorb water and is very elastic. Even NASA uses cork. 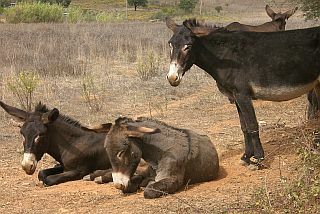 The donkey (burro) lived and worked with the farmers of the serra for countless generations. These animals carried their food and water, for no payment. Just some straw or rough vegetation is all they ask for. The donkey is a symbol for a way of life that was practical and simple and that used family traditions and skills. Farmers have lived with the working animals for thousands of years. Nowadays there are not that many Portuguese living in the countryside anymore. The young people often prefer the villages and cities because it is easier for them to find a job there. More and more quintas (farms) are left to become ruins. Hopefully, one day, they will find their way back to keep the traditions and culture of this specific part of Portugal alive. It would be a shame if so much knowledge and so many skills would disappear. Since a few years a whole category of former urbanites - especially from Northern Europe - are finding their "place in the sun" in this region, bringing genuine relief to rural areas. They are not only retired people searching for a calm, sunny place to live, but also "entrepreneurs" taking over businesses that the Portuguese no longer want. They live side by side in harmony with their Portuguese neighbours. Especially the older locals are happy to have neighbours again, even "estrangeiros". 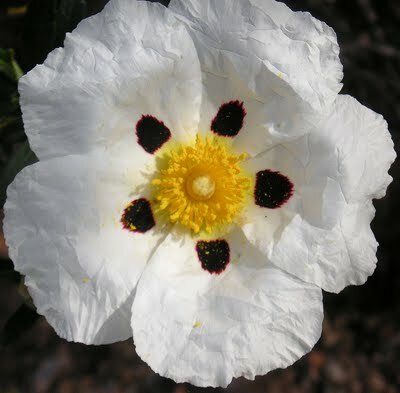 The "Esteva" (cistus flower or rock rose) symbolises the threats and opportunities for this area. This flower may in fact announce the irreparable desertification as well as the start of a regeneration. But it is worth noting that the inhabitants of the Serra (Serranos) have given the name "Bonanza" (prosperity) to the season when the cistus covers the hills with millions of sweet-smelling white flowers. The flower itself is delicate and pretty, but the plant it grows on is tough and you would never plant it in your garden for its beauty, but it gets a hot fire started in no time. This image fits the mountainside perfectly. January: oranges are ripening, almond trees blossom. Time of matança (pig slaughter). April: esteva (rock rose) flowers, poppies, daisies, orchids and wildflowers are abbundant. Orange trees blossom and release their perfume. 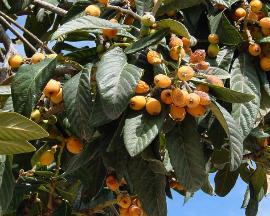 The loquat (nespera) fruit is ready to eat. The bee-eater is busy. May: time for the snales (caracois), apricots, pomegranate flowers. 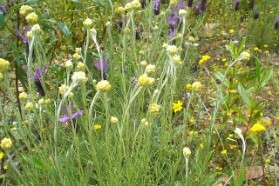 Wild herbs and many wild flowers. August: carob pods harvest (alfarrobas), aromatic inula, gum cistus, figs, grapes, mint. Start of the hunting season. October: olives and medronho (strawberry tree fruit) can be harvested. November: chestnuts, fungi, olives and medronho are gathered after the first autumn rains. In the countryside you will see a lot of olive trees (oliveiras) that produce the fruit used to make a wonderful and healthy oil (azeite). 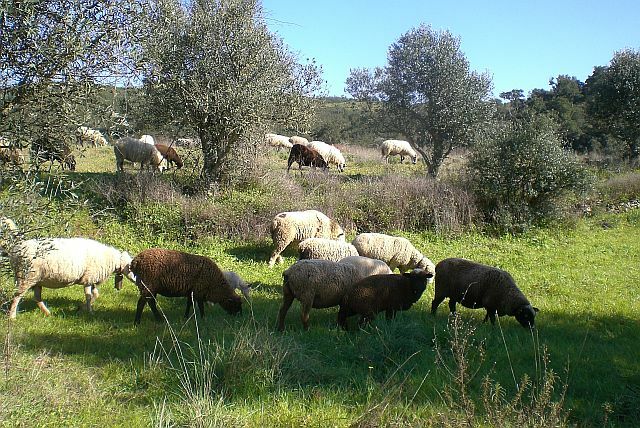 The locals also prepare the olives with herbs such as oregano and garlic, to eat them with a drink or a meal. For a recipe have a look at "traditional food". 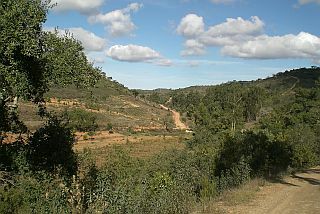 The river curving through the hills is called the Odelouca. 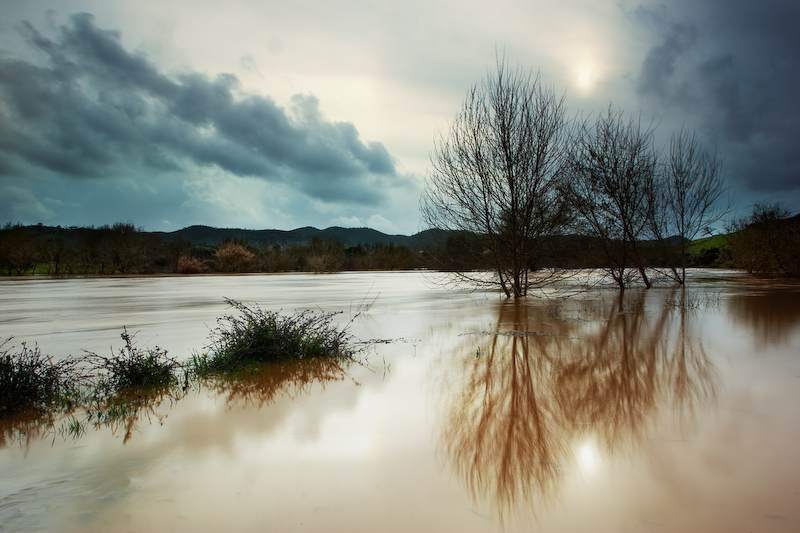 During the summertime it can almost run dry, but during heavy rainfalls in the winter or spring, it is possible that it floods a lot of land. This vegetable garden (horta) is being taken care of by one of the farmers in the serra. The soil in the hills is not very fertile and is full of stones and schist. So before planting, the soil has to be prepared with natural fertilizer and a system of gutters is made for the water to spread between the plants. 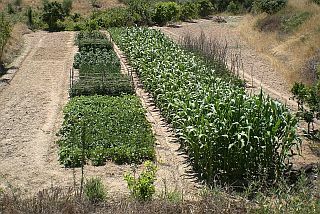 Tomatoes, corn, peppers, beans, onions, garlic, melons, potatoes and cabbage can be harvested after a lot of work has been done. Water is very precious in the Algarve, especially since the winters are becoming dryer and the summers longer and warmer. Most houses in the countryside have a barragem (dam), a well and/or a borehole to provide with enough water for the long, hot summertime. Often they also have one or more cisterns to store the water in. People watch the moon carefully and use their old traditional wisdom to plant and harvest according to the different phases of the moon. Although based on folklore and superstition, there is also some scientific evidence that proofs that e.g. seeds will absorb most water at full moon.